Message us to have your questions answered! Avalon U5 DI - Open Box. Please message us immediately if you wish to remove the signature requirement from your order. My U5 has made me realize the potential of all of my bass equipment. More importantly, it is helping me to realize my own potential as a bass player. The U5 is the holy grail for bass guitar. It would be a steal at twice the price. The U5 high-voltage DI-preamp combines a unique passive tone selector with a variable gain preamp and filter. The high input impedance accepts a wide variety of signal levels and instruments from acoustic guitars to high-output active bass guitars and keyboards. The U5 direct box is loaded with sonic character and user features professionals demand. Pure Class A, 100% discrete design Smooth musical detail and sonic excellence Variable gain preamp to +30dB. Dual microphone and line outputs Hi-Z 3,000,000 ohm input impedance Very low noise -100dB High headroom +30dB Six tone bank selections. DC coupled Class A output for superior bass High cut switch eliminates noise LED active signal indicator Headphone monitor output jack Low distortion less than 0.5% THD and IMD High level 400 watt speaker input Active to thru selector - ground isolation switch 100% discrete power supplies for audio path Internal toroidal power supply for low noise Long lasting, stainless steel hardware. The Avalon U5 Pure Class A instrument DI & preamplifier is the most powerful direct box available today. Designed to optimize absolute signal integrity and musical performance, the U5 includes many features and sonic excellence unequaled by lesser designs. The U5 is ideal for bass guitar and acoustic instruments, electric guitars, keyboards, synthesizers and low output pickups. Features include state-of-the-art, high input impedance input stage for zero load effect on sensitive pickups and keyboards, 100% discrete, Pure Class A signal amplifiers, practical user features and rugged hardware designed to deliver true high performance audio for many years. DESIGNED FOR DEEP & CONTROLLED BASS. Avalon U5 DI-preamps have been in use around the world since 1995. Six passive tone-EQ curves are also included to enhance a variety of acoustic and electric instruments. Twin DC coupled Class A output amplifiers drive both low level microphone preamp inputs and high level +4dB inputs for direct to tape recording or processing. The active-to-thru switch selects either the instrument input directly or sends the boosted-equalized signal to the amplifier via the front panel jack. A ground isolation switch eliminates any possible earth loop or AC buzz problems with complete safety. 100% discrete, high-voltage Class A. Switched 3dB steps, maximum gain +30dB. 3 , 000,000 ohm unbalanced (single ended). 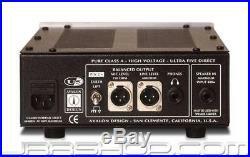 +24dBu unbalanced, 400w speaker input. XLR type, pin 2 hot electronic balanced. Maximum Output Level (Class A). +30dBu DC coupled, balanced 600 ohms (mic and line out). 0.5w into 600 ohms. 1Hz to 500kHz (input band limited). 3dB at 8kHz minimum phase design. Six position rotary switch, all passive filters. 8.5 x 3.5 x 12 in (216 x 88 x 305mm). Rack mount kit (1) RM-1. Single U5 19 inch rack mount kit (holds one half rack unit). Rack mount kit (2) RM-2. Dual U5 19 inch rack mount kit (holds two half rack units). Be sure to add JRR Shop to your favorites list. & check out our other items. The item "Avalon U5 DI Open Box JRR Shop" is in sale since Friday, December 29, 2017. This item is in the category "Musical Instruments & Gear\Pro Audio Equipment\Preamps & Channel Strips".